Curiosity's second drilling campaign at the foot of Mount Sharp is complete. Curiosity has now drilled at 5 sites: John Klein, on sol 182; Cumberland, on sol 279; Windjana, on sol 621; Confidence Hills, on sol 759, and Mojave, on sol 882. The rover spent about a month near Pink Cliffs, an area at the base of the Pahrump Hills outcrop, drilling and documenting a site named Mojave, where lighter-colored crystals were scattered through a very fine-grained rock. Very early results from CheMin show evidence for the mineral jarosite, which suggests a more acidic watery environment than the rover has encountered previously. Jarosite is a common mineral in the acid-washed sedimentary rocks at Opportunity's landing site. However, the science team can't say yet whether the acidic conditions prevailed while the rock was initially forming, or if they came later, as acid groundwater passed through and possibly altered the rock's preexisting minerals. Curiosity arrived at the drill site on sol 864, completed the full drill on sol 882, and drove away uphill and to the south on sol 896. As I write this, the rover is approaching a third Pahrump Hills drill site. I'll talk about that in the next update; this one concerns the drilling campaign at Pink Cliffs. Curiosity accomplished the full slate of drilling activities at Mojave in 17 sols of activity, which is relatively quick. But the rover actually spent 31 sols at the site. Two main things lengthened the rover's stay: the first attempt at drilling caused the rock to fracture, so they burned a few sols doing other science while they considered whether, where, and how to attempt drilling again. And they spent a week performing a software update, during which all other activities were on hold. A couple more sols here and there were eaten up by weekends; the mission mostly does not work weekends, planning three sols every Friday. I think Mojave has been the most "typical" drill campaign we've seen yet -- 900 sols into the mission they're really getting the hang of things! John Klein was the first, and everything took forever. Cumberland was much faster, but they held on to the sample forever. The campaigns at both Windjana and Confidence Hills were affected by problems with the MAHLI instrument and arm. Those problems have since been resolved, but they prevented Curiosity from doing all the documentation work that the team prefers to do at each site. Curiosity had no such problems at Mojave, although they are dealing with the new normal of operating ChemCam without its focusing laser, and the entire campaign was self-contained, begun and completed in a month, with two samples "doggie bagged" in SAM for possible future analysis. Here is how the drilling campaign unfolded; I'm counting up the days that contributed to the campaign separately, so you can see how I got to the 17-sol number. Campaign sol 1 (Sol 864): bump to drilling location, get photo documentation of site. A "bump" is a short drive designed to place a rover (Curiosity or Opportunity!) into a location from which it can reach targets with its arm. After the bump, the rover gathers a full set of images with both navigation and science cameras, providing a 3D map of the site in its "before" state. This drive happened on a Friday, so Saturday and Sunday (sols 865 and 866) were "nontargeted" science, also planned on Friday. Curiosity took the 6 images for this Mastcam panorama near a site named Pink Cliffs, at Pahrump Hills, on sol 864. The rover would spend another 30 sols at the site performing and documenting drilling and sample delivery at the drill sites named Mojave. The image encompasses an area roughly 1.7 meters wide. Sol 867: mini-drill at Mojave. With the necessary software update imminent, the mission swung for the fences, trying to make significant progress on drilling right away, going straight to the "mini-drill" test without a preload test first. Unfortunately, it didn't work out, and this day didn't advance the drilling campaign at all. A "mini-drill" is a shallow test drill to see how the rock responds to drilling. They use the arm to take APXS elemental analysis, then MAHLI photos of the drill site, then they place the drill against the rock, press down, and drill for a little bit. The mini-drill test showed that the rock did not hold up well to drilling; it fractured beneath the percussive action of the drill, dislodging chunks of rock out of the hole. Campaign sol 2 (sol 868): self-portrait. Although there's no requirement for it, the mission likes to get a MAHLI self-portrait at each drill location if time allows, because the drill locations are the most scientifically productive spots and therefore worth documenting for posterity. They can't currently do a MAHLI self-portrait with any drilled sample held in the sample mechanism in the arm turret, so they must either do it before drilling or after they complete the whole campaign and dump the sample. They hadn't planned to do a MAHLI self-portrait at this moment -- they were really trying to get to the full drill before needing to do their software update -- but the broken-rock problem required a day or two of thinking about so this proved to be a good time to drop a MAHLI self-portrait into the queue. This self-portrait is unusual because they added more MAHLI images to its edges later, making a nearly complete 360-degree panorama; previous 360-degree panoramic rover self-portraits blend MAHLI and Mastcam images. 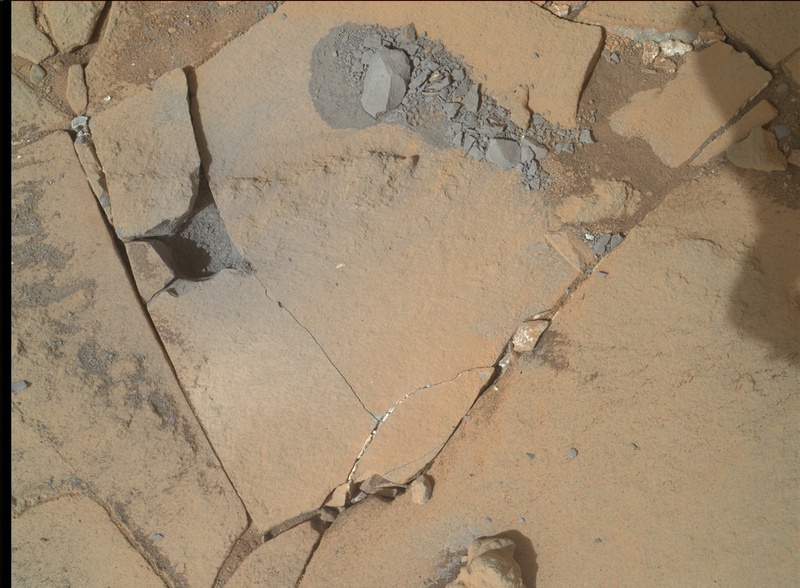 Sol 869-872: examine broken rocks, do other non-drilling science. With the weekend looming and not ready to proceed with drilling, they did opportunistic science on the freshly exposed broken rock surfaces from the first drill location, some ChemCam analyses of nearby rocks (including zapping near the next drill site), and a Mastcam photometry experiment, where they looked at the same spots of rock through different filters at different times of day to study how the angles of incoming light and Curiosity's point of view affect the brightness and color of the rocks and soil. Sols 873-879: software update. It takes a full week to do a software update, because uploading, verifying, installing, and verifying it on one computer takes two days, and the rover has two computers. During this time, the rover can't do new science, but the mission used the time effectively by transmitting a huge backlog of data to Earth. Campaign sol 3 (sol 880): brush and preload test on Mojave2. A new week on Earth and a fresh start with drilling. With APXS and MAHLI measurements before and after, Curiosity brushed close to the next planned drill spot, then pressed the drill on the rock to see if it would be a solid spot to drill. It was. 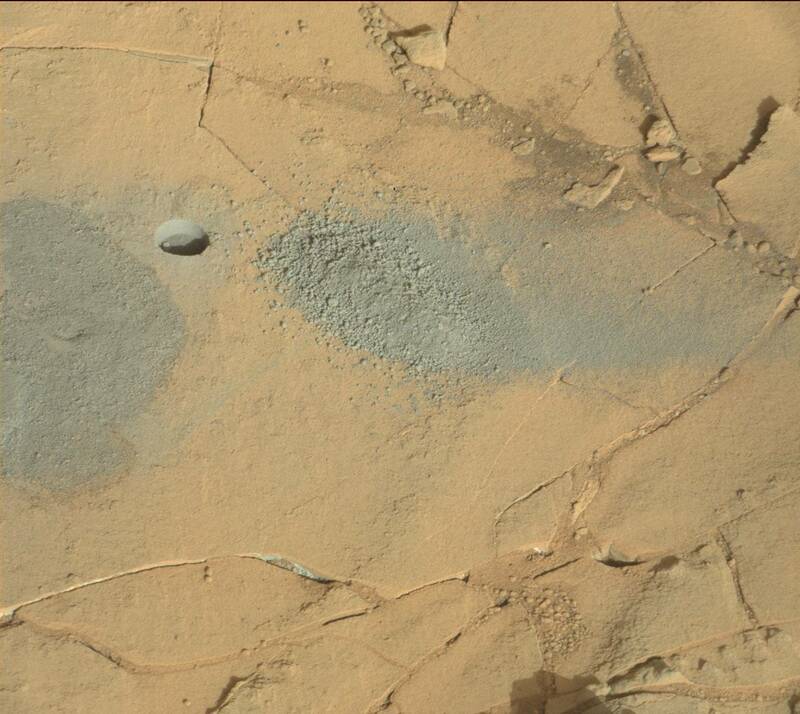 Campaign sol 4 (sol 881): mini-drill Mojave2. The two weeks since the previous mini-drill attempt had given the rover engineers time to deploy a new drilling method, in which they started drilling much more gently than before. The rock proved to be very soft, yielding to drilling with the drill hammering at only the first and second out of six possible levels of percussion. The mini-drill was successful. Campaign sol 5 (sol 882): full drill Mojave2, with MAHLI documentation before and after. 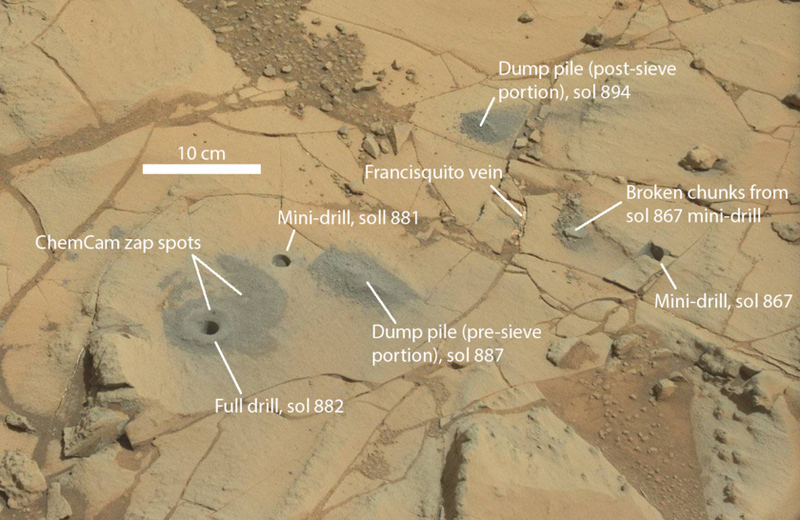 "Mojave2" was the second site where Curiosity attempted drilling at Pink Cliffs. 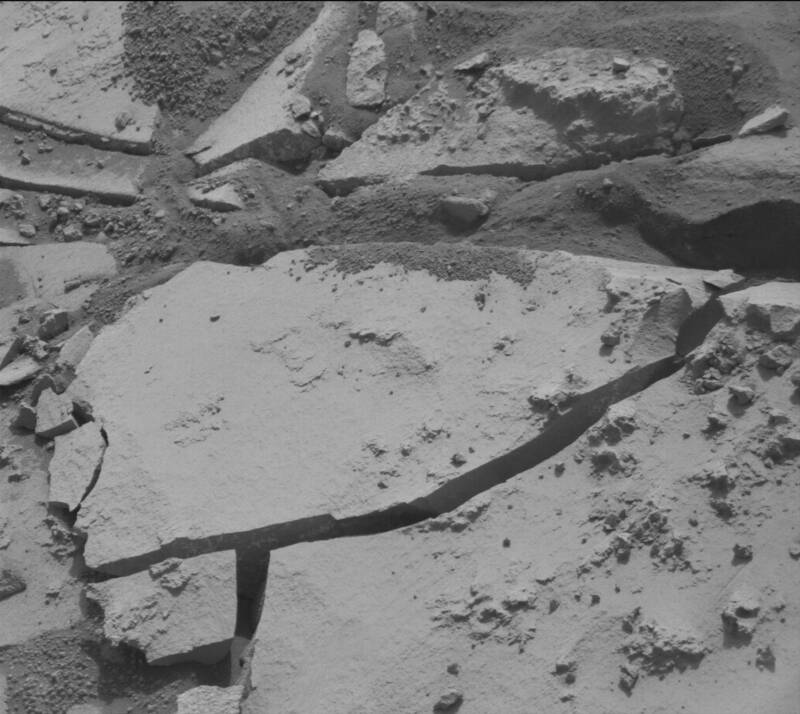 The rock was soft, requiring only the lowest level of percussion for Curiosity's drill. 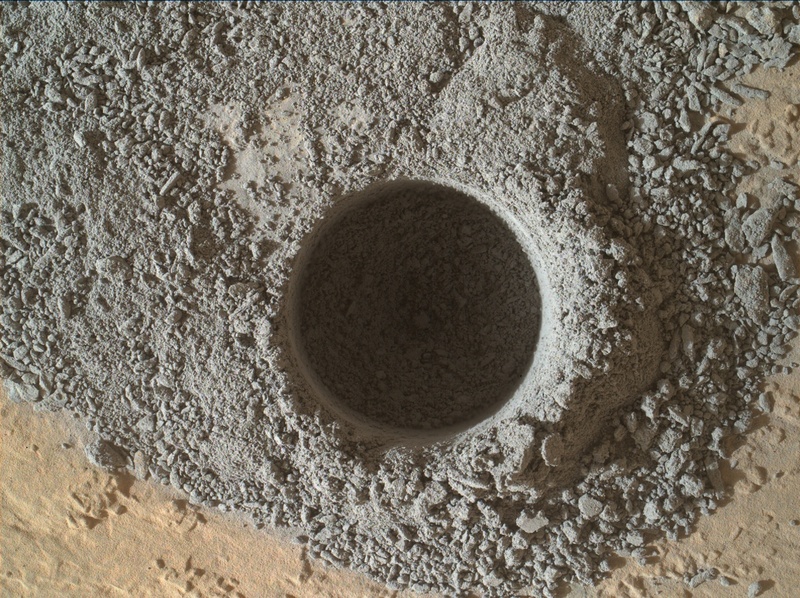 The drill hole is 1.6 centimeters wide; the smooth area around the hole shows where the base of Curiosity's drill pressed against the very fine powder. Some of that fine powder is much redder than the gray material that came from inside the drill hole; this is probably surface Mars dust. Campaign sol 6 (sol 883): remote analysis of drill tailings. 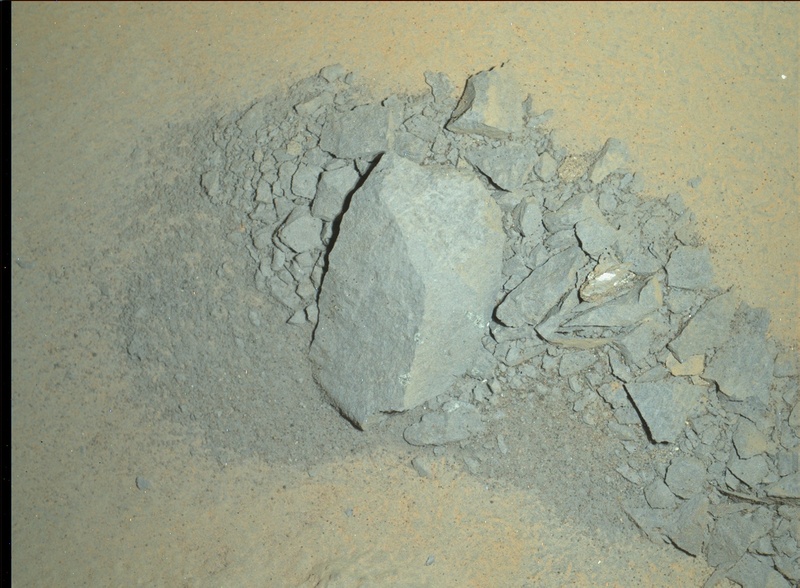 The pile of drilled rock outside the drill hole is freshly exposed Martian material, so they attack it with all their remote sensing instruments to document it thoroughly, providing a way to link the rare laboratory analyses of drilled material with the much more frequently obtained remote sensing measurements. The ChemCam laser left a nice blast hole in the tailings pile. After dark, they used MAHLI's flashlights to image the inside of the drill hole from all angles. Campaign sol 7 (sol 884): sieve powder, deliver sample to CheMin. Both of the rover's analytical instruments are designed to operate on powders with a grain size smaller than 150 micrometers. The sample handling mechanism on the turret twists and vibrates to pass the drilled powder through two sieves, and then opens so that the rover can visually inspect the sieved powder. They also got two distant photos of the drill site with MAHLI to slip into the self-portrait that was taken on sol 868. Sol 884 was planned on a Friday, so, ordinarily, they would also have had to plan two more sols of activity, but the team came in on a Saturday (January 31) to plan the next two sols. Campaign sol 8 (sol 885): CheMin analysis. The rover's two laboratory instruments are very power-hungry; using them leaves little power for other activities, and the rover has to spend time recharging. Campaign sol 9 (sol 886): ChemCam drill hole. Still recharging, and the Sunday of the two-sol weekend plan, the rover did some remote sensing work, blasting ChemCam both inside and outside the drill hole. At previous drill sites, ChemCam performed a raster of many laser shots up the inside of the drill hole, but the loss of the focusing laser has made it costlier to get each ChemCam measurement. Campaign sol 10 (sol 887): APXS future dump pile spot, dump unsieved portion of drill sample, deliver sample to SAM, SAM analysis. The coarser fraction of the drill tailings was dumped next to the drill hole. They got an APXS measurement beforehand, to better pin down the composition of the dumped tailings. Then they delivered a sample to SAM and baked it in SAM's oven, using the gas chromatograph mass spectrometer to sniff the gases as the rock yielded them to baking. This uses a lot of power. Campaign sol 11 (sol 888): MAHLI dump pile spot, begin overnight APXS of dump pile, recharge. Campaign sol 12 (sol 889): recharge, remote analyses of dump pile. There was enough power to allow some opportunistic science on a target unrelated to drilling, a vein named "San Francisquito." Campaign sol 13 (sol 890): Second CheMin sample analysis. There was a little power left to do some distant ChemCam shots and a profile across an interesting nearby nodule named "Searles." Campaign sols 14 and 15 (sols 891, 892): "doggie bag" two samples in SAM plus some other opportunistic science. The SAM team committed two of their sample cups to holding Mojave2 powder for future analysis, when time and power permit. Sol 893: Remote sensing of San Francisquito vein. The Sunday of a the three-sol weekend plan: no more arm work to advance the drill campaign, but an interesting bit of science on the side. Campaign sol 16 (sol 894): dump sample, check out turret, APXS dumped sample. Having sample inside the turret sample handling mechanism limits what the rover can do with its turret because it's much more complicated to plan turret maneuvers in a way that will keep the powder in its desired position in the arm, so they dump it before they depart, and then examine every surface inside the sample handling mechanism to make sure it's clean and in good condition, including a thorough inspection of the spot welds on the 150-micrometer sieve. As far as I know, the spot welds are in good shape. Campaign sol 17 (sol 895): remote sensing on dumped sample, MAHLI nighttime imaging of drill hole and CheMin inlet. On sol 896, they drove away. Here's a photo from sol 895 that contains evidence for most of the activity at the Mojave drill and dump sites. Curiosity performed drilling activities at a site named Mojave from sols 864 to 895. One Mastcam photo taken on sol 895 contains evidence of most of the activities. You may notice that there are a couple of Sundays that didn't advance the drilling campaign much. I've occasionally had people ask: they're operating a multibillion-dollar international treasure with a limited lifetime on Mars! Can't they staff weekends? It's true that you could operate the rover more of the time by working weekends or even sticking to Mars time. But it wouldn't result in a more effective mission. Sure, Curiosity is a robot; but humans make Curiosity go. Working through weekends or at weird hours has a massive, negative effect on the quality of the rover's human operators' lives, especially for people who have families. It's doable (although stressful) for a short mission -- like the 90 sols after landing, which are usually operated on "Mars time" -- but a lot of people simply won't choose to work on a mission whose schedule kills you. Working Curiosity is already difficult enough on weekdays; the nominal planning timeline takes 10 intense hours to complete, every single day of operations. Operating a mission with bizarre hours selects mission personnel not based on how good they are at operating a rover, but instead based on how crazy the hours they are willing to work; you'll lose a lot of good people to projects that are equally exciting but less unreasonable in their time demands, and the good people who stay can get burned out with overwork. So the mission has decided that the incremental improvement in the number of hours that the rover can work on Mars is not worth the toll it would take on their personnel to work every weekend. There are some times when it would make a big difference in the speed of Curiosity's progress for the team to work on a Saturday. You'll notice they did that on sol 885 -- that was a first, for the extended mission, and you may see occasional future Saturdays. But they'll only work those Saturdays when they receive data from the rover on a Friday night that allows them to perform driving or arm activities on the Saturday. As I mentioned earlier, they're now in a spot much higher in the Pahrump Hills section, where they hope to drill again. With no software update looming for a while, there is a good chance that they can complete the next drilling activity and hit the road again within the next four weeks. That would be convenient for rover scientists; four weeks brings us to the Lunar and Planetary Science Conference, which is the year's biggest space geology conference, beginning on March 16. Following is the summary of each sol's activities from the USGS Astrogeology news site. The drive toward “Pink Cliffs” went according to plan, so in the Sol 864 plan we will be doing a very short drive (called a “bump”) toward our drilling target: “Mojave” (shown above). Before the drive, ChemCam will analyze 5 locations in a line across a possible mineral vein in the rock, at a target called “Harrisburg”. This type of observation, called a “raster”, was quite common before ChemCam’s focus problems, but this will be the first time doing a 5-point raster since the focusing laser stopped working. ChemCam is still collecting images and spectra at multiple focus positions per point, to make sure we get good data. After Harrisburg, ChemCam will also study a broken rock target called “Beers”, where it will take spectra and several stacks of images at different focus positions. This will provide good data for testing the focus, plus interesting science data from the freshly exposed portion of the broken rock. Mastcam will provide supporting images for both ChemCam observations, plus an image of a location where the rover ran over a small sand ripple, at a target called “Doughnut”. (I promise, Homer Simpson did not name our targets today!) Navcam will also do a dust devil search. After that, the rover will drive about 10 meters to get into position for drilling, and we will take Mastcam and Navcam images of the surroundings. On Sol 865, our main activity is a measurement of methane in the atmosphere by SAM (Sample Analysis at Mars – the onboard chemistry lab). And then on Sol 866, we have some routine atmospheric observations by ChemCam, Mastcam, and Navcam. Over the weekend, Curiosity did a short drive to get into position to drill at “Mojave.” The previously acquired MAHLI images of this target show some really interesting crystals, and we’re excited to use CheMin to figure out what minerals are present. The main event in today’s two-sol plan is to do a mini-drill at Mojave. Before we do a full drill deep enough to collect rock powder, we do a mini-drill in preparation. We’ll also collect a number of MAHLI images before and after the mini-drill to characterize the drilling location. The plan also includes some DAN observations to characterize the subsurface near this site. Then we’ll acquire APXS of the mini-drill hole to assess the composition of the freshly exposed material. On the second sol we will move the arm out of the way to image the hole with Mastcam, and then Curiosity will acquire a self-portrait. We like to take these “selfies” at each of the drill hole locations to document the site, and it’s also a good way to check up on the state of the rover. Looking forward to more drilling on Mars! he "mini-drill" test on the Mojave rock target completed successfully, but MAHLI images taken after the test showed that the rotary-percussive drilling fractured the rock. This was not expected, so the tactical team had to quickly change the Sol 869-870 plan. While we were hoping to drill a deeper hole and acquire a sample of the drill cuttings before the upgrade of the software onboard the rover next week, the rock fragments dislodged by the mini-drill activity provided a rare opportunity to examine freshly-broken surfaces. Field geologists usually carry rock hammers so that they can break rocks and examine the fresh surfaces. On Mars, the drill has served as MSL's rock hammer! 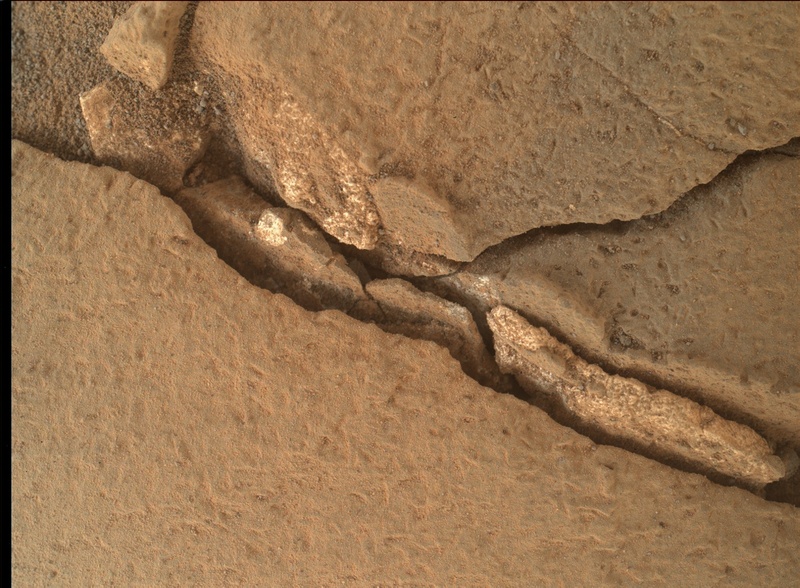 So the Sol 869 plan includes ChemCam measurements of the fresh chunk of rock and the bottom of the mini-drill hole, followed by MAHLI close-up images of the dislodged rocks, both during the day and at night (illuminated by the LEDs). On Sol 870, the brush will be used to clean off another potential mini-drill target, dubbed "Funk Valley." 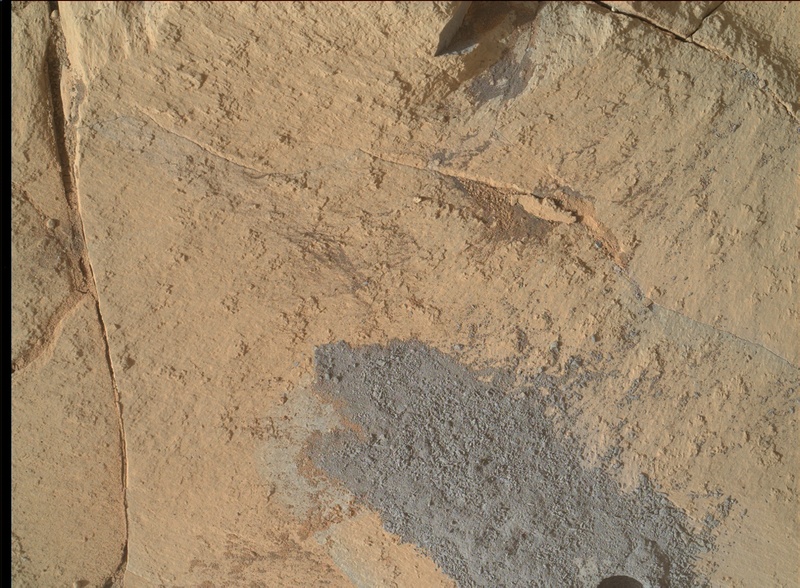 MAHLI images of this new target will be taken before and after the brushing, then the drill will be "preloaded" (pushed down) against Funk Valley and a potential full drill target to determine whether the rock is strong enough to safely drill. Finally, MAHLI images will be acquired to see the results of the preload tests and the APXS will be placed on the brushed spot for an overnight integration. This morning the MSL operations team realized that the results of the MAHLI activities planned for Sol 870 will not be received until Saturday. Therefore, if there is a problem on Sol 870 that halts the sequence while the MAHLI dust cover is open, the cover would remain open through the Martin Luther King holiday weekend. To eliminate the risk of such a situation and possible effects on the software upgrade planned for next week, the team decided not to send the Sol 870 command sequences to the rover. Unfortunately, this means that the brushing and drill target investigations planned yesterday will not occur, but they can be done after the software has been upgraded. The Sol 869 activities planned yesterday will not be affected by this change, and should be completed today. Meanwhile, many of the MAHLI self portrait images acquired on Sol 868 have been received. When all of them have been returned to Earth, they will be assembled into the latest rover "selfie." Today’s plan for sols 871 and 872 is our last chance to get some science done before we begin a week of no activity while the engineering team upgrades the rover software. The plan is to do two ChemCam “rasters” on targets “Funk Valley” and “Rainbow Basin”. Each raster will analyze three closely-spaced spots on the target. Funk Valley is our latest candidate mini-drill target (our last mini-drill ended up breaking the rock, so we’re trying again), and Rainbow Basin is a rock with some interesting erosion-resistant knobs. Mastcam will take supporting images of these targets and then we will be spending a pretty big chunk of time doing some data management for Mastcam, transferring less-compressed versions of some images from Mastcam’s internal memory over to the rover prior to the flight software update. The last activity on sol 871 will be an overnight analysis of the chunk of rock that our first mini-drill dislodged, using APXS. This is a rare chance to do APXS on a target with a fresh, non-dusty surface! On sol 872, ChemCam will do some passive observations of the sky to measure how much oxygen, carbon dioxide, and dust is in the atmosphere and Navcam will do some routine atmospheric measurements. There are also a bunch of Mastcam images of the same locations at different times of the day. These are part of a photometry experiment, which is trying to understand how the sun scatters off of the martian surface at different angles. 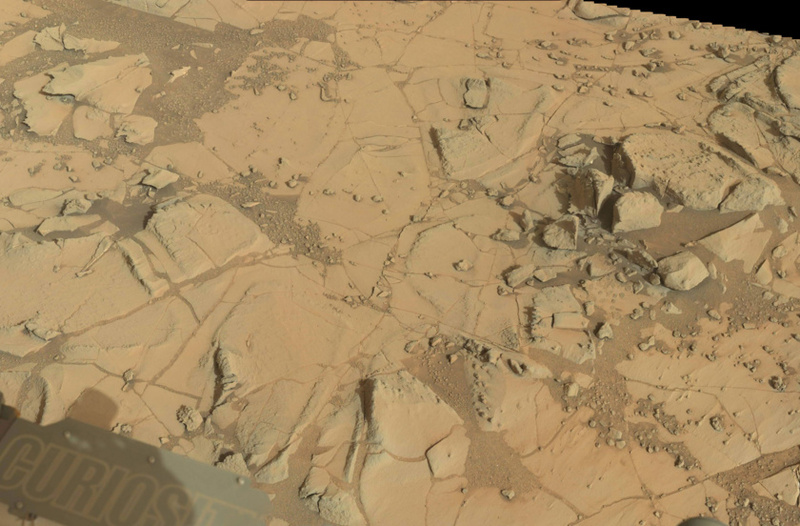 There are also a handful of Mastcam images as part of a change monitoring campaign. The long break for the software update will allow us to look at the same locations in a couple weeks and see if any sand has been moved by the wind. If all goes according to plan, there won’t be a lot of rover activity over the next week, but the team will be busy poring over the latest MAHLI images of our drilling area and the chunks that were dislodged during our first mini-drill! There won't be any MSL science planned this week because the rover's software is being upgraded. 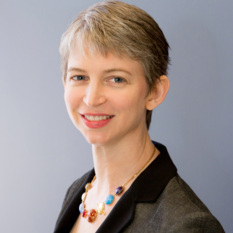 I was scheduled as SOWG Chair today and tomorrow in case the software transition had to be aborted, but so far it is going well so the science operations personnel have been released. While I'm a bit disappointed that we won't be planning new scientific observations and related activities, I'm glad that the software transition is going well. The flight software transition is going well, and Curiosity is doing a test run of the new version. Both the prime and backup rover computers are on track to commit to the upgrade by this weekend. However, this means that it’s a pretty quiet week in terms of science operations. In the meantime, the team is focused on all of the new MAHLI images that we’ve received of the latest drill hole and the surrounding rocks that were broken during drilling. Speaking of new software, we’re looking forward to testing out the new OnSight software developed by a JPL team in collaboration with Microsoft. The software uses holographic computing, and will allow scientists to study Curiosity’s worksite from a first-person view. It sounds like this will provide a great new perspective and will be very useful for future planning! For more information on OnSight, check out the recent press release. In spite of missing a command uplink due to a temporary outage at one of the Deep Space Network sites early last week, the flight software transition went well and the MSL operations team is back to planning science activities! Lots of good observations were proposed, so many that some ChemCam and Mastcam activities had to be deleted from the Sol 880 plan to ensure that the rover batteries maintain enough charge to allow the drill-related activities planned for Sol 881. But Mastcam images of areas previously disturbed by the rover are planned, to look for changes caused by winds. The focus of the Sol 880 plan is to brush a potential drill target dubbed "Mojave2" and image it with MAHLI. The drill assembly will then be pushed against Mojave2 to determine whether the rock is thick enough to drill. After sunset, MAHLI will use its LEDs to take higher-resolution pictures of the brush spot and the chunks of rock thrown out of the Mojave mini-drill hole. Previous MAHLI images show that images taken at night often provide useful complementary information when compared with daytime images of the same target. Finally, the APXS will be placed on the brushed spot for overnight integration. Well, we’re certainly hitting the ground running after our flight software upgrade! Today we received some very nice MAHLI images of the target “Mojave2“ that the rover brushed on sol 880. We also got the results of our “preloading” test, where the drill is pushed against the rock to make sure it isn’t going to shift as we drill. Mojave2 looks nice and stable, so the main activity in the 881 plan is to do a “mini-drill” in this location. Last time we tried mini-drilling at “Mojave”, we broke the rock apart, so we’re all waiting eagerly to see if Mojave2 is better behaved. Other than the mini drill and various documentation images, the main activity for sol 881 is an overnight APXS measurement of the drill hole. I was on duty today as “Keeper of the Plan” (KOP) for the geology theme group, which means I help the geologists on the team translate their desired science into a set of activities scheduled at specific times. Usually, the plan for a sol has a “science block” where the science team can put any observations that will fit. Today was a little different: because we’re doing the mini-drill, there isn’t any room for a science block, so it was an easy day to be KOP. If the mini-drill goes well, there won’t be any science blocks in the sol 882 plan either, since we will be busy doing a full drill hole, but if the mini-drill breaks the rock again, the full drilling might be canceled. If that happens, we need to have a plan for what else to do, so that was what the geology group focused on today. This way, we will make the most of sol 882 even if we can’t drill! The mini-drill activities planned for Sol 881 went well, so we are "go" to drill and acquire a new sample on Sol 882! I helped plan the Sol 881 MAHLI images, so was particularly happy to see them this morning. One of them was taken of the intended full-drill target--it shows tailings from the mini-drill hole, which will not interfere with more drilling. 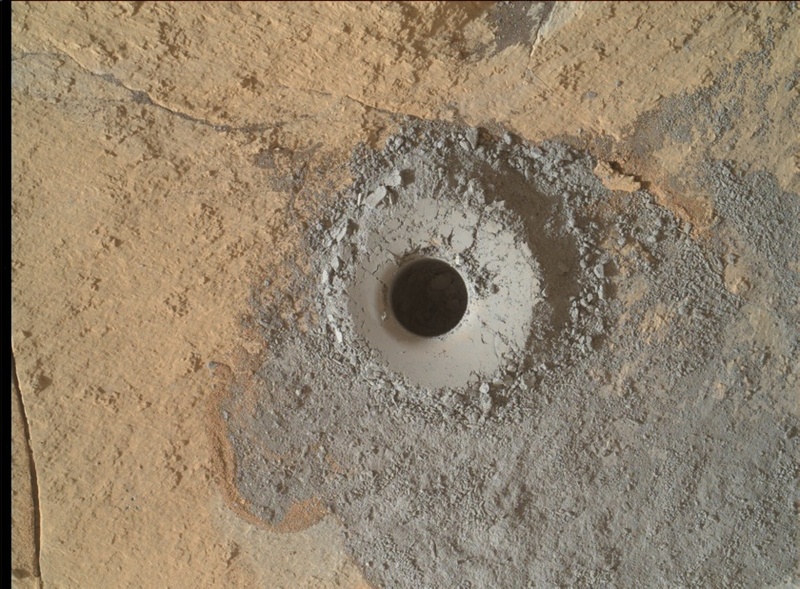 So the Sol 882 plan starts with higher-resolution MAHLI images of the drill target, followed immediately by drilling the full hole. Then images of the new drill hole will be taken before the rover sleeps overnight. On Sol 882 Curiosity completed another full drill hole on Mars. The target was “Mojave2” and it proved to be much more stable than “Mojave” (our previous attempt at doing a mini-drill at Mojave resulted in breaking the rock apart). This time everything went smoothly and we have a beautiful new drill hole to analyze. The main activities in today’s plan are ChemCam, Mastcam and MAHLI observations to characterize the drill hole and tailings. First we’ll acquire several ChemCam LIBS observations of the drill tailings to study their composition. Then we’ll image the drill hole using all of the Mastcam camera filters. Overnight, we’ll acquire a number of MAHLI images to characterize the drill hole and tailings. Looking forward to learning more about the composition of this interesting target! After successfully drilling the target “Mojave2” on Sol 882, the next step is to deliver the sample to CheMin for analysis. 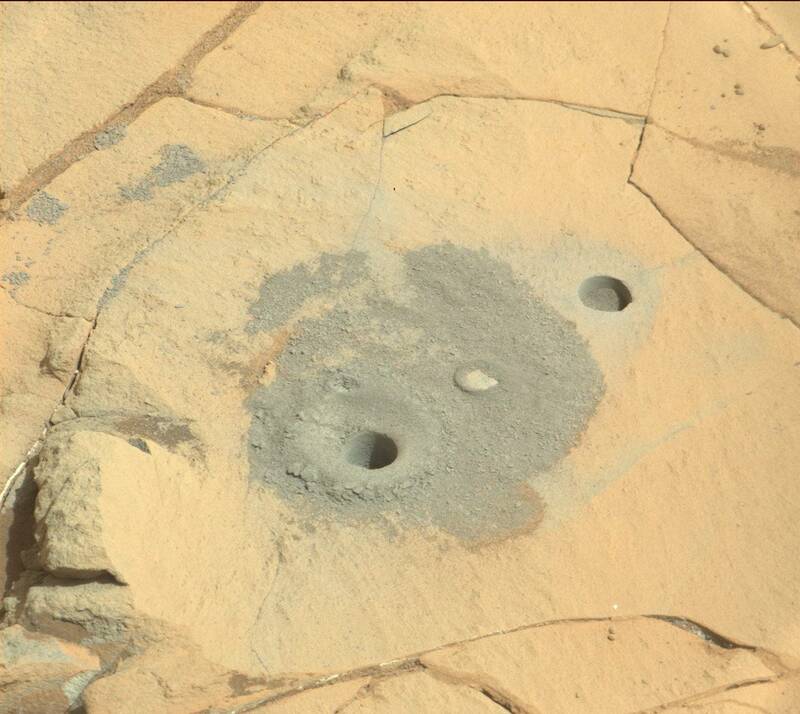 We acquired some great Mastcam and MAHLI images of the drill hole and mini drill hole, and we’re looking forward to learning more about the composition of this sample. The main activities in today’s plan are to transfer, sieve, and drop-off the sample to CheMin, and also to acquire APXS on the drill tailings. The plan also includes a few additional frames to fill in the MAHLI self portrait. And even though today is a Friday and we would normally be planning 3 sols to cover the weekend, the team has decided to take advantage of some Saturday operations to maximize our number of planning days. A big thanks to those team members who volunteered to work tomorrow! The rest of us will be traveling to Pasadena this weekend for our team meeting next week. I’m sure there will be a lot of new data to discuss! I'm SOWG Chair today, so I called in to enough of the operations planning teleconferences on Saturday to ensure that I was familiar with the goals for Sol 887. Most people don't like working on weekends, but I definitely felt that it was worthwhile to do as much as possible while MSL is active on the surface of Mars. The activities planned for Sols 885-886 went well, and we received images showing that the plasma "plumes" created by the ChemCam laser blew holes in the pile of drill tailings (e.g., just right of center in the image above). The Sol 887 plan focuses on delivering some of the new drill sample to SAM and performing a SAM evolved gas analysis of it. This requires so much power that we can't do much else on Sol 887, and Sol 888 activities will be limited by the availability of power. The Sol 887 data received this morning show that a sample portion was successfully delivered to SAM, and the un-sieved part of the sample was dumped onto the ground as planned (the pile is just above center in this image). Sol 888 activities are limited by the need to recharge the batteries, but we were able to plan a full suite of MAHLI images of the dump pile and place APXS on it for an overnight integration. With very few additional activities in the plan, it has been a relatively easy day for me as SOWG Chair. The Sol 888 data show that the rover's batteries are recharging, and we received more data than expected. So Sol 889 planning is less constrained by power, and we were able to include ChemCam and Mastcam observations of the dump pile (center of this image). In the afternoon, a full suite of MAHLI images of the bright vein dubbed "San Francisquito" will be taken. The APXS will then be placed on the rock adjacent to the vein for a short integration after sunset, then centered on the vein for a full overnight integration. The APXS data obtained in these two positions will allow the chemistry of the vein to be more accurately compared to that of the surrounding rock. MSL's batteries are almost fully charged, so the Sol 890 plan includes another CheMin measurement of the "Mojave2" drill sample. CheMin and SAM require more power than the other instruments, but we want to better understand the mineral composition of the drill sample before we dump the rest of the sample and drive away, so these observations have high priority. In addition, ChemCam and Mastcam observations of a nearby target named "Searles" are planned, along with images of distant targets. I'm not scheduled SOWG Chair today, but of course I wanted to call in to the operations teleconference to see how things are going, and was glad to see that the Sol 889 activities we planned yesterday completed successfully. For example, this ChemCam RMI image shows the hole the laser made in the dump pile. The three sol plan will keep Curiosity very busy this weekend. The main activities in this plan include dropping off part of the Mojave2 drill sample to the SAM instrument, and some remote sensing activities with Mastcam, ChemCam and Navcam. The samples that we’re dropping off to SAM can be thought of as “doggie bags” because we’ll take the sample with us for analysis at a later time. The first sol of the weekend plan also includes several atmospheric monitoring activities with Navcam and Mastcam. The second sol includes a number of ChemCam observations to assess the chemistry of a soil target and perform some instrument calibration activities. The third sol is devoted to ChemCam and Mastcam observations of an interesting vein target named “San Francisquito” to assess its chemistry and test ChemCam autofocusing in low light conditions. The vein was previously captured in this MAHLI image. I’ll be on duty as the Geology Theme Lead on Monday, so I’m trying to get up to speed to prepare for next week! The planning day kicked off to a great start, with the SOWG Chair (Aileen Yingst) reminding us that we do have the coolest job in the world. I’m the Geology Theme Lead today, and it certainly feels like an exciting job. In this plan we’ve managed to use almost every instrument onboard the rover to characterize the most recent drill sample and the surrounding environment. First we’ll dump the post-sieve sample, and then we’ll “thwack” and vibrate CHIMRA (the Collection and Handling for in-Situ Martian Rock Analysis) to clean out any remnants of the sample. Later in the plan we’ll use MAHLI and APXS to characterize the grain size and composition of the dump pile, and Mastcam to document the pile with all of the camera filters. We’ll also use ChemCam to assess a nearby vein, and MAHLI will carry out some nighttime imaging of the drill hole and CheMin inlet. We don’t often mention it in our blogs, but every sol we’re also collecting RAD, REMS and DAN data for radiation assessment, environmental monitoring, and neutron detection. Meanwhile the SAM instrument is patiently waiting to analyze the samples that we “doggie bagged” a few sols ago. I like this Front Hazcam image that came down over the weekend – I feel like Curiosity’s shadow is striking a strong pose, having conquered the “Pink Cliffs” outcrop and ready to move on to the next location!